I saw the shadow of my bicycle from tree to tree as I rode atop the Los Angeles Riverbed between the 105 and the 91 freeway going south. I saw the silhouette of a little girl riding her bike on an afternoon sunset after she finished her homework and had dinner, and I remembered. I had not ridden my bike here probably for the past six years. The smell, the river scent, the industrial feel, the dry river, all felt the same. I rode parallel to Banana Park where I grew up and lived the first twenty years of my life. I lived on the east side of the river, in The Sans, the worst neighborhood in Paramount, so they would say. Parallel to the river, parallel to the 710 freeway, I passed under Somerset Boulevard, to my right, I passed the Compton Golf Course, went past the Home Depot, past the empty lot of land—empty since I could remember—past the horse stables, past the wooden houses underneath Atlantic Boulevard bridge that connects Long Beach and Compton, past the edifices made of cargo containers that probably entered the Port of Long Beach, and then past the graffiti mural walls behind some factory, and into a darkness. I rode through the underpass of the 91 freeway, a vast dark area the size of a hardware store with a dirt ground. Gang graffiti outlined the walls—it has always been there. Gang members operated there, for they were often underneath the bridge. I remember the feeling riding my pink bike that my dad bought me at Paramount Swap Meet, or at a yard sale when I was around 8 years old. The sight produced a feeling of fear. Anxiety. Paranoia. A gun shot going off. Falling. Dead. I would pedal as fast as my legs could give. It always seemed eternal passing through this underpass. The senses were vibrant and present: the smell of damp earth, white crusty bird poop sprinkled on the bike path underneath the freeway where the birds housed their nests, a chicken fence outlined the bike path, and the sound of the 91 freeway above me echoed loud in this empty dark space. The rush of cars above me made the ground seem to shake. The wind pressed against my face and a hundreds of mosquitoes splattered on my face, holding my breath to not inhale them in; they crashed into my eyes and fluttered for freedom as they stuck to my eyelashes. I pedaled faster than any other place. I did not care that my legs burned. This was about life. I felt an immeasurable fear as a little girl, but I refused to not go through it. It wasn’t fair that someone else, something else could keep me from going through, from traversing to the other side. And I did. I sped as I went up the ramp to see the south side of the path leading to Long Beach. And I breathed again as if I had held my breath underwater this whole time. I breathed liberty, fresh air. Blood rushed through me, an adrenaline to my feet, and I was close to flying. The river bed does not look the same as before, as it did 10 or 15 years ago. A wall four feet high, now outlines the bike path on the side of the river. I remember the days as a little girl, living right by Banana Park, my sister, my cousins and I would go over to the riverbed and go down to the river, only a few inches of a dense brownish composite, that could not be water. Our cousins, Rocky and Abraham sometimes brought dead animals up from the river, poking at them with sticks. We’d crowd over it and observe. We must have been fascinated at some aspect of this act, wonderstruck at our keen observing. I wonder what joy we obtained from this, or why was it that we did it. Other times, as we were older, Laura, my sister and I would leave the house after disputes with our family, tensions, or before tears could burst out of our eyes in front of each other. We’d go outside and walk up to the riverbed. We’d sit at the edge of the bike path atop the riverbed and stare at the setting sun. Sometimes we’d talk about the situation, other times we’d sit in silence. Perhaps to remind ourselves that there was something larger than our present reality. When I bought my own bike at the age of 18, after any strong sentiment, I’d get on my bike and ride up to the bike path and race as fast as my legs could give, as fast as the strong emotion–mostly anger, frustration, stress, anxiety–would last. It was liberating. I felt like I could run forever sometimes. I always loved the feeling of feeling like I could run away. In that time, I’d listen to “Learning to Breathe” by Switchfoot, one of my theme songs during that time, during my bike rides. The warm tungsten lights glowed in the streets of Oaxaca de Juarez. The evening unfolded into a black and white scene. It was my last night in the city and the wanderlust passion elevated me to a zealous dimension. I sit in the light of the moon tonight. I contemplate its illuminating love. It is charged, glowing with full potential. My whole being is enthralled in its presence. In two days I will leave the States to embark on a life dream to live in Mexico. As I sit here and reflect, memories awaken my flesh into nostalgia. I remember the diary entries, five to ten pages written back to back on the first day back from my childhood summers spent in Mexico. 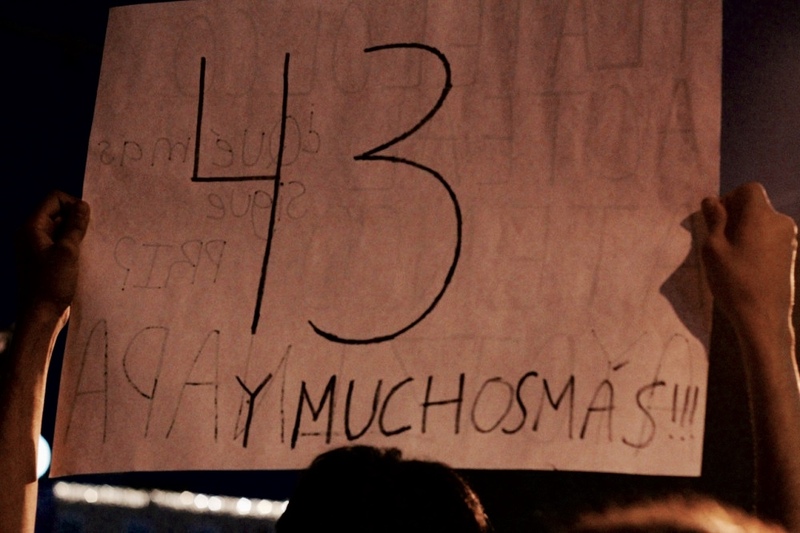 Today marks exactly one year since the disappearance of the 43 Normalista students in Ayotzinapa–Students in a rural town in Guerrero studying to be educators, aspiring to provide a better life for their families, their community. The atrocious act sparked outrage in Mexico and the world, drawing light to the murderous narco state.